It would seem to me that the wealth effect was filling most State Treasury’s with every new home refinance and with all the extra auto purchases that filled this last decade. In part it’s a political lack of will that had revenue in the local economies. Budgets for most States had revenue increases but not any corresponding tax adjustments to match the markets wealth. A financial crash and gas shock caused a general disavowed SUV’s as the auto of choice from 2008, and before 2008 few in the economy new that general private incomes were on a slide to negative increase for the decade. The failed wealth effect left all States without needed tax support. This is really a California apologist’s only defense. Our State’s Legislature, is a politically dysfunctional body that has shot itself in the foot. I’d like to see these numbers broken out to show the difference between wage growth and wage + benefit growth. I suspect the biggest culprit is the health care system–the government simply raises health care benefits in line with the pace of health care inflation. So I bet vigorous health care reform might end up solving that problem. Maybe private sector wages dipped too low, rather than public sector wages being too high? If the private sector had a greater proportion of workers dip below the poverty line, I can’t see why anybody would want government to replicate that. I suspect that part of the trend is also accounted for by more and more of the lowest-paid government jobs being outsourced to the private sector, driving the average wages further apart. The lines actually show that inflation adjusted wages were growing in the private sector, though not as fast. Increased production should lead to real wage increases. The economy wasn’t struggling back in 2004 when wages began stagnating. Most of the gap you are so concerned about was run up between 04 and 07, i.e. pre-crisis. Everything was apparently between fine and great depending on how close you were to housing bubbles scamming, productivity increasing, but wages stagnating. I just find that graph to be very uncompelling as an argument against the public sector. A few thoughts. My guess is that, for the most part, the level of education of public sector workers is higher than the private sector as a whole. Consider the fact that these numbers probably include public university employees, teachers, staff scientists in agencies such as environmental science, energy, public health, etc., plus all the support staff. It also includes sanitation workers (where not privatized), but a recent speech by Mayor Blumenthal highlighted the fact that NY sanitation workers require a high school degree or GED. It is not uncommon for police officers in many metro areas to have bachelor degrees or better. In addition, I believe that the prior comments hit the nail on the head with respect to the stagnation of private sector wages and benefits. I also agree with respect to health care costs. Finally, good or not, the public sector is probably the last bastion of defined benefit pensions. They are a fairly costly benefit. @Matt – You have to remember that public sector wages are paid for with tax money extracted from private sector wages. If private sector wages fall then public sector wages gave to fall as welll, or you’re going to have a problem. Not really Thom. GDP is still growing, it’s only wages that are stagnating. Taxes to pay for public sector wages can be gained from non-wage sources of private income as well. It’s not as cut and dry as you would like it to be. GDP growth was negative for much of the steep decline in wages. State and local government tax revenue is largely derived from wages, whether they be received through sales taxes (primarily paid with wages), property taxes (primarily paid with wages), or income tax (a tax on wages). It makes sense that tax revenue will decline in a recession. Governments should expect to spend more and take in less during a downturn, but they should also expect to take in more than they spend during an upturn. Unfortunately, instead of saving for a rainy day many state and local governments chose to pass excess tax revenues on to their employees in the form of wage increases. Realistically, this compounds the crisis once it occurs. You also have to remember that the private sector is many times larger than the private sector, and that a not-insignificant number of private sector workers earn very large amounts – if the graph above tracks a median wage, as opposed to mean, the very high earners would be evened out. But in a graduated tax system, they count for a lot. Also remember that government has choices about how it spends its money – these are value decisions. Do we value foreign wars more than public sector employees? Arts endowments? Military research etc… As an above commenter noted, taxes-wages is not a zero-sum calculation, so a reduction in private sector wages doesn’t necessarily entail a reduction in public sector wages; you need another premise in there about valuing wage equity between sectors, or valuing all other expenditure highly enough that you’re willing to sacrifice public sector wages. The chart unfortunately normalizes both to 100 at 2001 while what is actually needed is a comparison of levels. Was government pay lower or higher in 2001? I expect higher actually since it is large, labor intensive, with many layers of management, rewarding credentialism and tenure, but while the overall pay is probably higher, it is probably also flatter with more middle management but less at the actual top where perks rather than pay dominate than the private sector. Government would use the same excuse executives make, don’t you want to attract the best workers in to these areas? It is likely entirely health and pension which is the only area that grew over the last decade. Interesting, graph,. However, it is difficult to interpret without information about how the job mix has evolved in each category. There was a huge push to outsource gov’t services in recent years. Janitorial, security, food service are typically easier to outsource than management and that would lead to a divergence in average wages. Also, wages have diverged for high school vs. college educated workers in both sectors. If, as PAC notes above, the public sector has more educated workers, then average wages in that sector would expect to diverge from the private sector. With out more information, we don’t know if your inferences are due to the fallacy of composition, true policy differences, or some combination of these factors. Several comments echo my thoughts — the mix of professions, the portion going to health care, etc. might reveal a lot. Certainly there was a time when teaching could not compete with the private sector for wages, so it fell to dedication and decent benefits to bridge that gap, poorly at best — I have a hard time believing that much has changed in that regard. Neither would I want my fire chief and police to have their wages cut down simply because so much of the private sector has been pushed into retail clerking and truck driving — I would prefer attacking the structure of the economy. In the meantime, perhaps governments need to recognize that in a service economy, services cannot remain immune from taxes, and the public needs to understand the presumptions behind payment for their public services and what has shifted. In my own experience, property values plunged but property taxes still went up; however the materialistic over-consumption of imported goods seems to have dropped a bit and it amazes me that there was no contingency planning for that. It could be the wave of the future, particularly with an aging population that will eventually slow the upgrading of kitchens and the wearing out of tires and cars with commuting. I would be hard pressed to believe that education has anything to do with the divergence. If this were the case, a similar divergence would have been seen prior to 2004. But let’s not delude ourselves. The divergence would be far greater if job losses were taken into account. Not only does the public sector pay more, it has kept far more employees on during this downturn, neither of which it can afford to do. What I’m arguing is not that the difference is explained by a differing mix in professions, but that some of the divergence might be explained by a shift in the mix of professions over time. Yes, the arithmetic IS very clear. Just eyeballing that graph, virtually all of the difference comes from stagnation in private sector pay between 2004 and Q1 2008. The recession started in December 2007 by most measures. 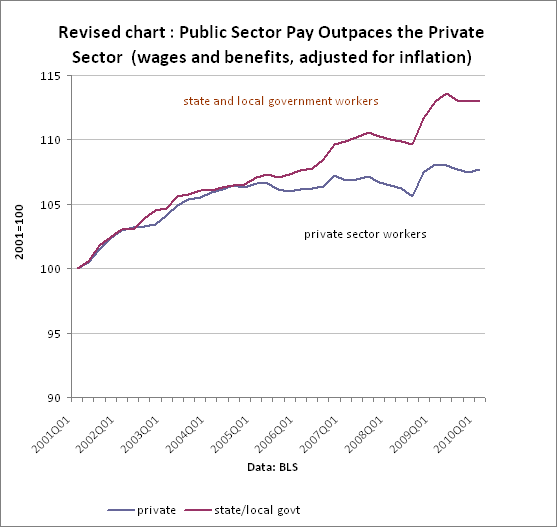 This graph doesn’t show higher wages for public workers “while the private sector struggles;” it shows the private sector sticking it to private sector workers. You are mistaken. The graph shows that the private sector lives within the bounds of reality. If the private sector can’t pay its bills, it MUST cut costs. It is quite obvious that the public sector works outside these bounds. No, its was business that never live within its means for the whole decade. In this time period the Dow hit above 14,000, Car Sales above 16 million units, Bonus hit constant new highs only matched and passed after the crash, Oil Co’s scored $100red’s of billions no matter what the underlining cost. This chart shows only that business did not share any of that wealth with labor. By starting off your comment with, “No, its was business that never live within its means…, this implies that you believe that businesses have not, while the government has. This notion is laughable. When you point to the fact that car sales skyrocketed during the boom, you appear to understand that businesses simply responded to demand. Private businesses increased hiring during the boom and laid employees off or cut hours during the bust. Another way of saying this is that businesses are forced to live within their means. After the crash, an extremely small percentage of private industry workers saw increased bonuses. The vast majority saw their bonuses dwindle or disappear altogether (even in the banking industry). And I’m not sure what your point about oil company profits has to do with this discussion. (1) Economists estimate that CPI (inflation) is overstated by approximately 1%. If this is true, real monetary wage growth is understated by nearly 10.5% over the past decade. (2) There has been a significant increase in non-monetary wages (fringe benefits) over the past decade. As a result, wages are even further understated. Is this anything more than just a normal cyclical pattern? The data goes back to 1982 and when you look at the growth of the entire series it appears that public compensation growth just follows private compensation growth with a one or two year lag. Maybe we should wait a year of two and see if the pattern reverses before we get too excited about this. Government workers also pay taxes. Because the ECI measures price of labor per hour, the chart explains very little. In fact, the chart is consistent with governments contracting out less-skilled work, reducing new hiring, and putting employees on unpaid leave. Each of these cost-cutting measures could increase the amount paid per hour of labor, as the pool of government employees skews to more experienced, older workers and there is a greater ratio of benefits to hours worked. This seems to be an argument that a number of commenters to agree with. But the fact is that low-skilled (and lower wage) private employees have been hit harder than any other demographic during this downturn. 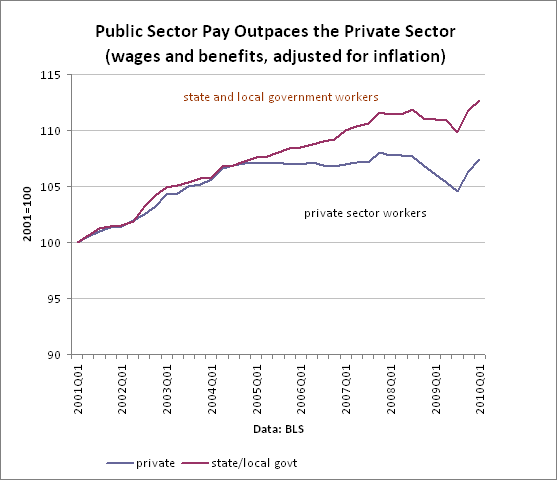 As a result, private sector wages are far more overstated than public sector wages. Are you saying: 1. low-wage employees have been laid-off, 2. private sector now skews towards higher-wage employees 3. the higher wage employees increase the perceived cost of private sector workers. ? If so, I don’t think you understand how the ECI works. You should read the explanations provided at bls.gov. Are you really arguing that said occurrences push perceived wages up in the public sector, but do nothing to private sector wages? How does unpaid leave increase the cost per hour of labor? It seems getting paid less to work proportionally fewer hours would be a wash.
Public sector employees generally have non-wage benefits that remain at the same level regardless of a reduction in hours worked. Accordingly, if they work less hours at the same pay rate and with a constant non-wage benefit level, their compensation per hour would go up. This chart shows the change in labor costs compared to the baseline year, not the actual wages. This doesn’t tell you which group is making more now unless the wages were the same in 2001. “Overall, federal workers earned an average salary of $67,691 in 2008 for occupations that exist both in government and the private sector, according to Bureau of Labor Statistics data. The average pay for the same mix of jobs in the private sector was $60,046 in 2008, the most recent data available. That’s federal and the graph is for state and local. I think Matt Matson has the right idea. But first and foremost, the period since 1Q2001 is both cyclically unusual and not very long. How does hours worked by employee factor in? I’d guess public sector employees have worked much more steady numbers of hours, but I’m not sure, and I’m not sure what the bottom line effect of that would be. And uclalien’s quote notwithstanding, I’m not confident that the BLS data series give an accurate reflection of apples-to-apples comparative numbers. I also think that there are a number of other factors that probably ought to be considered/controlled for, particularly job tenure and dispersion — I’d like to see what the median numbers and 75th percentile numbers are for each group. I’d also like to be reassured that non-wage (bonus) compensation of all kinds is factored into both. Finally, I’d like to see the public sector numbers broken down — working for a municipal government (particularly a small local government) is at least as different from working for a specialized Federal department as a working for a small entrepreneurial business is different from working for a multinational. In any case, it should come as no surprise to anyone that downward adjustment of wages for the public sector is stickier than for private sector. I’m not sure what this is a graph of. Is this the average compensation of government workers vs the average compensation of private sector workers? If so, the Bush Administration pushed the government to outsource many of it’s lower paying positions. The transfer of the bottom half of the average pool from public to private may make most of the difference in these numbers. The USA report uclalien cites is pure unadulterated garbage. Give me a day or two to show data and I’ll really tell you what I think of it. One of the issues with doing real tracking of public sector vs. private sector comparisons is that (a) the jobs aren’t necessarily apples to apples and (b) you cannot get (as) good incumbent data for private sector employees. Take for example, http://www.dfwsalaries.com – if you are doing research on public sector pay vs. private sector pay, you cannot get this kind of incumbent data from the private sector, with the exception of publicly traded executive level positions (proxy statements). Additionally, some public sector jobs exist because there is no market, nor profitability with the services they provide, as such, there cannot be a defined market value for that position, because there is no position in the services that are provided as a whole. Compensation cost levels in State and local government should not be directly compared with levels in private industry. Differences between these sectors stem from factors such as variation in work activities and occupational structures. Manufacturing and sales, for example, make up a large part of private industry work activities but are rare in State and local government. Professional and administrative support occupations (including teachers) account for two-thirds of the State and local government workforce, compared with one-half of private industry. That’s why I compared changes rather than levels. I suspect the divergence between the two groups could largely be explained by an uneven distribution of low skill jobs withing the private sector and the cost of living environments in which government jobs exist. The public sector employs far fewer people at the high school diploma/bachelors degree level electing to contract out to the private sector for these positions. Also, government jobs exist in major metropolitan areas for the most part, which skews the pay upward for the positions solely because the cost of living in these areas is higher. Control for these 2 factors, and it is likely the gap would be closed considerably.